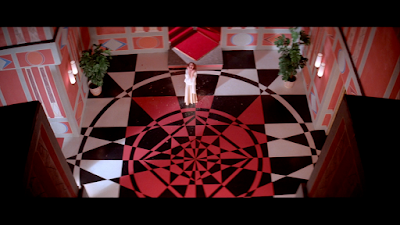 The colours in the film also work to give an element of discomfort and they act as a warning to the insane and dangerous moments that take place throughout the film "And then there's Argento's masterful use of deep primary colours — the sets are bathed in garish red and green light (he acquired 1950s Technicolor stock to get the effect) giving the whole film a hallucinatory intensity." (Smith, 2000) This feeling of hallucination works to make the audience feel confused and intimidated which enhances the films horror characteristics. The red lighting which can be seen in figure 2, gives off a sense of danger that warns the viewer that something bad and violent will take place soon. The colours also let the audience know when the characters are in a safe situation and they are used to create a sense of disturbance. "The safety of the Freiburg airport gives way to the psychedelic terror of the Academy, where Suzy has been propelled into Alice's terrifyingly colorful rabbit hole. The film's visual palette is suggestive of a hierarchical journey through the Academy. Hallways are bathed in reds, yellows, and blues, and, in effect, different rooms in the school begin to take on a meaning all their own." (Gonzalez, 2001) The actual visual effects of the colours make the characters stand out in their personalities as the colours relate to parts of the building and their intentions which can be seen in figure 3 as the moments where the character is feeling innocent are the moments when the lighting is paler and softer.